Painshill Park is a place that is on my doorstep and one that I confess to not visiting as often as a I should. Painshill Park is located in Cobham, Surrey and is just just a short drive from where I live. Painshill Park not the first place that I’ve been meaning to visit and then blog about! It really is a place I should make a point of exploring more often as the seasons change. I could go on about the history of the park, but I’d just be copying and pasting what’s on this page. The first thing that stuck me about Painshill Park was it’s sheer size. You would have no idea that a place as vast and roam worthy resides just a couple of turns off of the A3. The second aspect of park that I found interesting were the different structures nestled in different corners of the park, and how well this fit against the natural landscape of the Park. After entering the main grounds and passing through the main gate, I was greeted by the kitchen garden that was open to explore. The kitchen garden is enclosed behind a rather charming and eloquent red brick wall, this gave the feel of a secret cottage garden, waiting to be rediscovered. At this time of year everything was winding down toward the end of the season, but following a very hot summer it was good to see plants in a good condition. 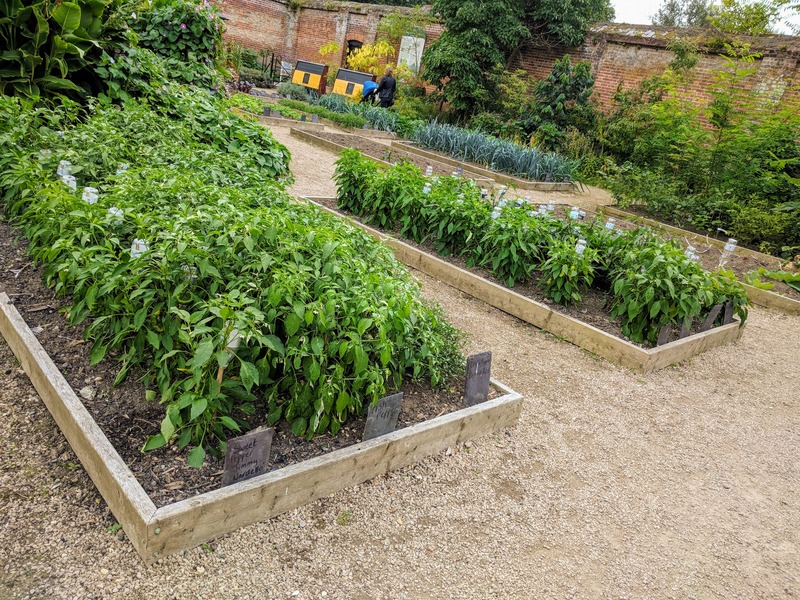 Plants like leeks, chilli plants, pumpkins, squashes and even runner beans were going strong – not to mention the flowers and pollinators that encompassed the main growing area. 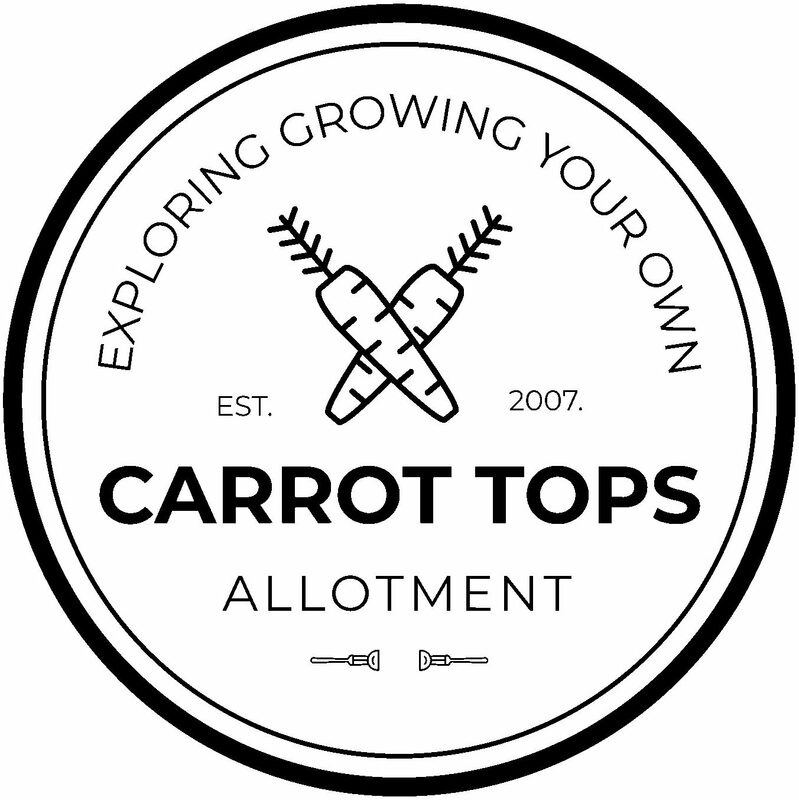 Because I’m starting to re-do my plot, It was a great opportunity to see how other’s are building structures to support their plants and see how big their beds are. As I left the kitchen garden, I found myself walking around the rest of the park to discover what else was in store. What I liked about Painshill were the inclines, shielded by age old fir trees that led to some fantastic views of Surrey and beyond. I didn’t know exactly where the landscape gardens started and ended and this is part of the appeal. 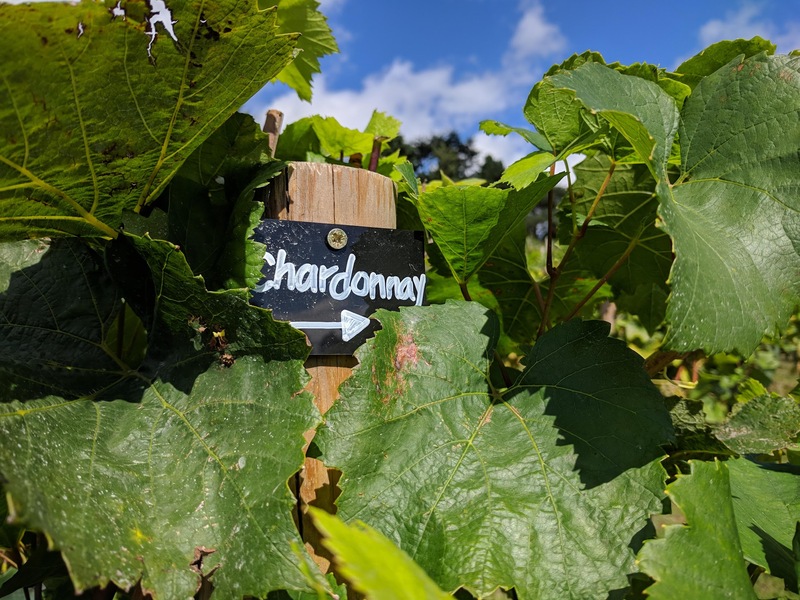 At one point I was standing on top of a large hill looking out on rows and rows of grape vines and a vast body of water that entwined the grounds. I seriously couldn’t believe my eyes. These jagged and large rocks that stood in front of me looked out of place on the landscape I had been passing through. 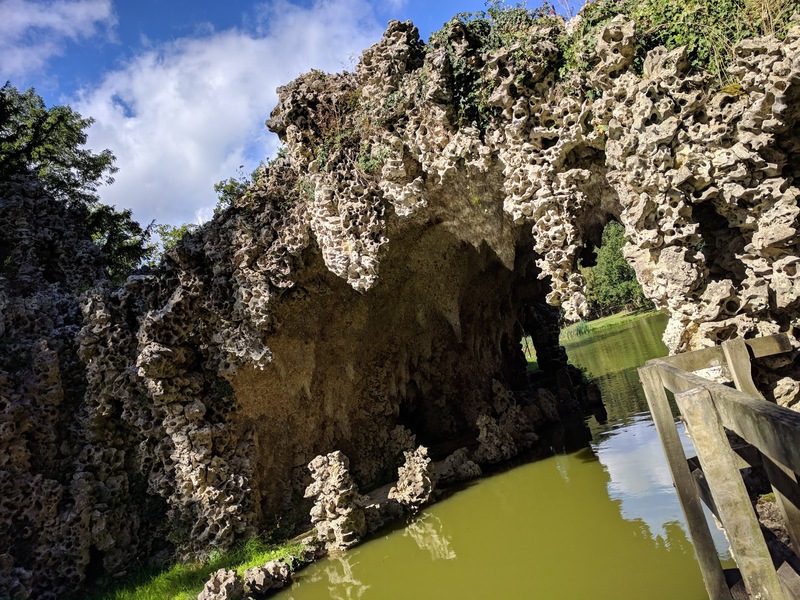 The Crystal Grotto at Painshill is a magical, naturalistic cave with shimmering, bubbling water, rough rock and stalactites covered in sparkling crystals. The Grottoes Hamilton saw in European gardens had water, rough rocks but were more architectural as structures. He may have seen some of the natural caves along the Roman coastline of Italy. At this point I was starting to get more of a sense of the place, this grotto was built to resemble a more natural aspect of the location. At this time year, the grotto sparkled in the sun, but I can imagine this becoming a more magical setting as Autumn passes through into winter. I was amazed at all of the intricate little holes that existed int the rocks, I’d love to know if these were man made, native to Surrey or shipped into the gardens when it was built – either way this was a great discovery. After exploring the crystal grotto, I was at the base of the vineyards, but not before standing in the quiet and peaceful shadow of what looked to be the old gothic temple – but don’t quote me on it! It was great to see healthy bunches of red a green grapes hidden among these bushy vines. I was even more intrigued to see that they were wine making varieties – which reminded me of just how little I know about grapes. I understand the vineyard was added to the grounds after Charles Hamilton’s travels across Europe during his Grand Tour. 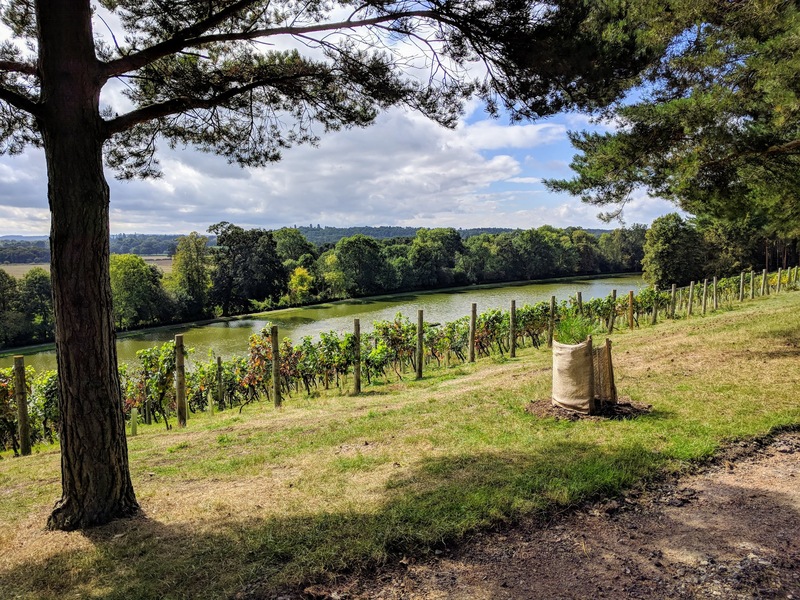 Since leaving Painshill, I’ve kicked myself for not picking up a bottle of Painshill wine in the gift shop, just to see what it would be like. I’ve yet to walk around and explore a vineyard, so this was a real treat on what was a fantastically sunny day. 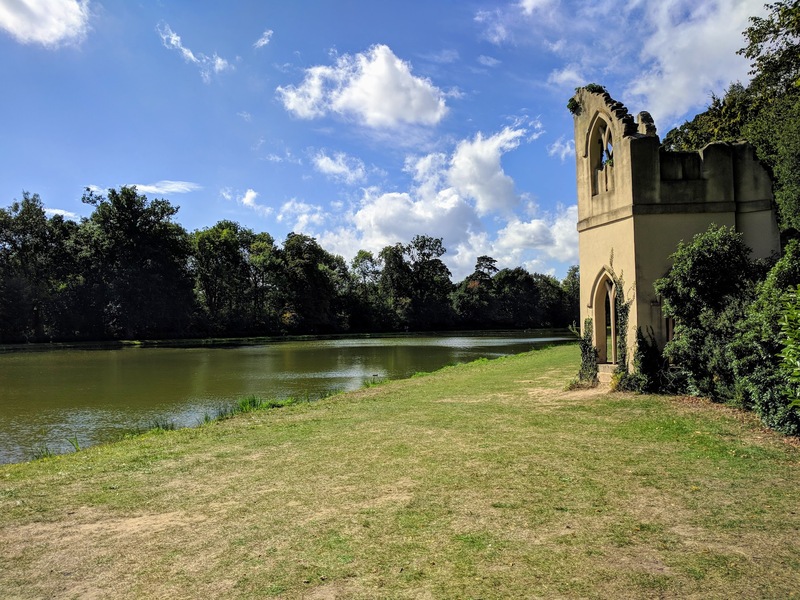 I understand from this article that Painshill Park is still under restoration, meaning it’s definitely worth a visit every now and then if you’re looking to kill a few hours, get outdoors and are maybe intrigued to see it’s progress and development. Overall, I found Painshill Park enchantingly British.